Shame on you to call people that have children injured 'a shande'. Well for me even if I agree but now that it comes from this Mayer there must be some corruption, now I'm beginning to think twice what's behind this. Seems like something that should have been done long ago. I don’t understand. If they declared a public health emergency, why can’t they mandate that everyone not yet up to date with their MMR vaccine and is medically allowed must vaccinate within X days? By the time someone was exposed to the measles, it’s too late to to fight this specific exposure with the vaccine. Per the Feds it takes 21 days for immunity to kick in after the shot. That is why some doctors recommend an immune booster for babies that were exposed to the Measles. But then they aren’t allowed to vaccinate for a few months, which could violate this mandate. It’s a huge mess, but not just by the anti-vaxxers, but by there not having been a medical consensus about all this earlier. Most 6-12 months olds were not given the extra MMR shot, not necessarily because their parents are anti-vax, but because this new recommendation wasn’t broadcast properly. Additionally, bringing all those exposed to medical centers for an MMR shot will likely spread the Measles even more. If the city is serious about this, they should hire doctors or nurses to do home visits for vaccination. The Willies have been trained to do the opposite of everything. When you get engaged legally marry first so you can get benifits, instead of working for a paycheck scam the government, instead of filing permits build first, instead of figuring out housing situations have five children, instead of getting a steady paycheck go begging in Flatbush and other “modern” neighborhoods, should I go on? I take back part of my last comment as I didn’t clearly understand this article. 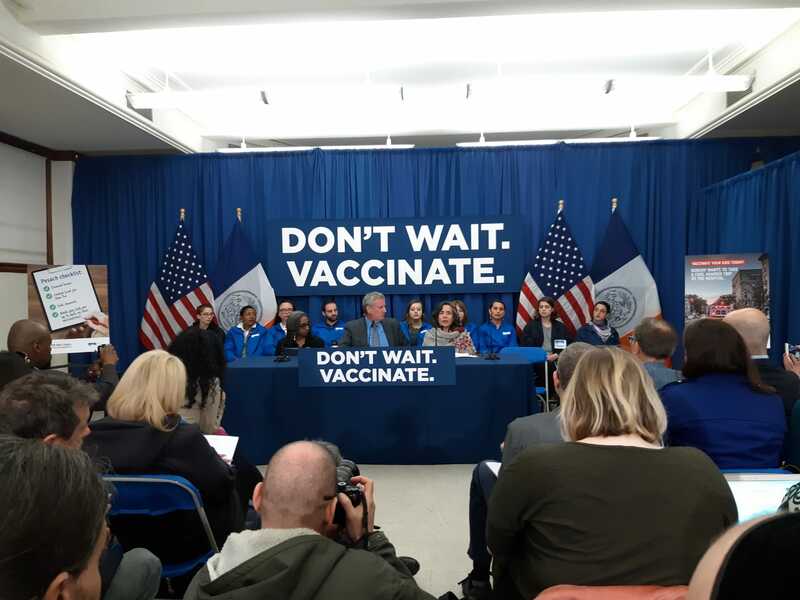 Basically, everyone in those zip codes must vaccinate, but enforcement will be done by checking up on the immunization records of those that have been exposed to someone that contracted the measles. So you think you're smart?! No. 1 you have no clue about Dinah demalchuss that it doesn't apply here, go learn. No. 2 when the doctor says metzitze bipeh is dangerous everybody was smarter and laughed it off. Wow, you don 't sound like a Yid yourself! Allow your government to make Health decisions for you, don't wonder when they ban Metzizah Bepah, our education next! Once the government gets to decide what to inject in our bodies we are in bad shape. Seems like it's you who need to crack open a Gemorrah... there are only three dispensations for ignoring Dinah d'Malchusah Dinah - none of which apply here. Regarding metzizte bipeh, it is dangerous if an infected child's mohel goes on to circumcise another child and do metzizte on the second child. Why don't you think of the possible consequences to others of your I know better than anyone else attitude? First of all you have no clue what you're talking about, you are just an ignorent person trying to sound intelligent, Dinah demalchusah is only on taxes and business (ramba"m hil' gezaila perek 5), and it's not valid if it's only on a part of society (certain zip codes). Metzitze bipeh law was on every mohel not only on those effected (we don't need laws for that, there is no normal mohel that does it knowingly that he is infected). Go get a life before spewing hatered and non sense. Of course #13 is right, but we live in a politically correct society where you can say the harsh truth, yes we should attack those haters with all our might. “ Allow your government to make Health decisions for you, don't wonder when they ban Metzizah Bepah, our education next! Sorry Willi, the gov't didn't decide that you need vaccines. The scientific method and medical science did. Mayby your leeches, cups and bleeding isn't working too good, nu? Another stupid comment, it's the government that mandates not the scientists nor any doctor's, there are many scientific study's and facts out there and many doctors, I am not obligated to lead my life according to any of them it's only the government that Forces this on us. Do you have any clue what individual freedom means? I have the right to choose if I wish to follow any doctor's recommendation or not. I am close to Modern Orthodox. I daven often in a Shtibel and I wear a cap most of the time. I also work in Willy. I have a Doctoral level degree and two MS degrees. You are wrong in many of your allegations. Two blatand statements of yours beg for a reply. 1, In my experience, the Chassidic community has the most access and the most knowledge of how to bend (not break) the rules and get things permitted. They are long past the stage you are dreaming of. Just today a skyscraper in Manhattan had a stop order over a blatant illegal plan, not Chassidim. 2, I am astounded at the Satmar approach to giving tzedaka, it might be that they take care of their own and the collecting you see is for those in Israel. At the same time as we are doing this, we should have have health booklets for incoming travelers. showing all imuniations! MMR, TB, Polio, etc. They used to do it and stopped! Of course you're right, those pro vaxxers are a bunch of hypocrites, this same Mayer that just mandated immunization in Williamsburg is one and the same for sanctuary cities let all illegal enterys with all kinds of diseases but don't dare asking illegals for any immunization records than you aree racist and a bigot. To #26 It would stop spreading disease and that is the main problem! The "illegals" are the cleaning ladies for you Hasids, and btw, they vaccinate. Cannabis is the cure to measles, but the "gov't" covers it up! Right, individual freedom means the right to spread diseases and cause the deaths of other people's children's deaths. Chasid is right on. When there is no inert placebo controlled safety studies on ANY vaccine and scientific fraud done on studies that these holy doctors site, how is any Yid obligated or even allowed to inject aborted fetal cell tissues and treifa animal tissues? This is government that controls and mandates based on their own scientists that have conflict of interest. Big Pharma is controlling the govt. The anti-vaxxers are not just trying to be "healthy" and want "to do what they want". They are uncovering the fraud that is going on. Now they are recording what is going on in the ACIP meetings for the world to see. That's why govt/big pharma is censoring and forcing the people in the name of public health. Why force chicken pox vaccine? Why the Hep B for NEWBORNS? It is shocking to hear that only 5 days was the most that trial lasted for. Listen to Plotkin's deposition and you decide what science is acceptable to you. These laws violate the Nuremberg Code and unconstitutional. We Yidden need to stand up and protest so history does not repeat itself. It won't repeat itself exactly the way it was. Just in a more modernized way. Wake up! Search for the truth! Do the people from Williamsburg with measles live in Williamsburg or just go to a doctor there? You're just talking non sense, they don't have any records and are not asked for and they are all admitted to school. Placebos have been proven to work, and BTW, infants can get Hep B from needles, and chicken pox is deadly. A good proxy for the "placebo studies" are all the pandemic illnesses and deaths that occured before the vaccines. My mother, almost a century ago, had "brain fever" (encephalitis) from measles and almost died. Hey, Anonymous, thanks for signing on the last line with your real name. Yet there are many public health regulations that "force" people to do things like vaccination because sometimes it's not just about you but about the broader community. But we've also had to "force" things like seat belts and fire exits. It doesn't mean that there is anything wrong with seat belts or fire exits, just that people won't use them, or developers won't install them, without being forced to do so. Because even well intentioned people are lazy or because they think "it won't happen to me" or "it won't happen to my child." Just because they don't have records doesn't mean they didn't vaccinate. The records are for you filthy antivaxxers who openly say you are against it, so for you there is a greater burden of proof. Your name says already the positions you hold, no oint responding to you.